How have you been!? Sorry for the lack of posts last week. There was just a lot going on that I had to take care of. I'm hoping things get better but you know how life goes. Well it's October and I'm back again with the WNAC challenge. I know I'm behind but I'm play catch up lol. 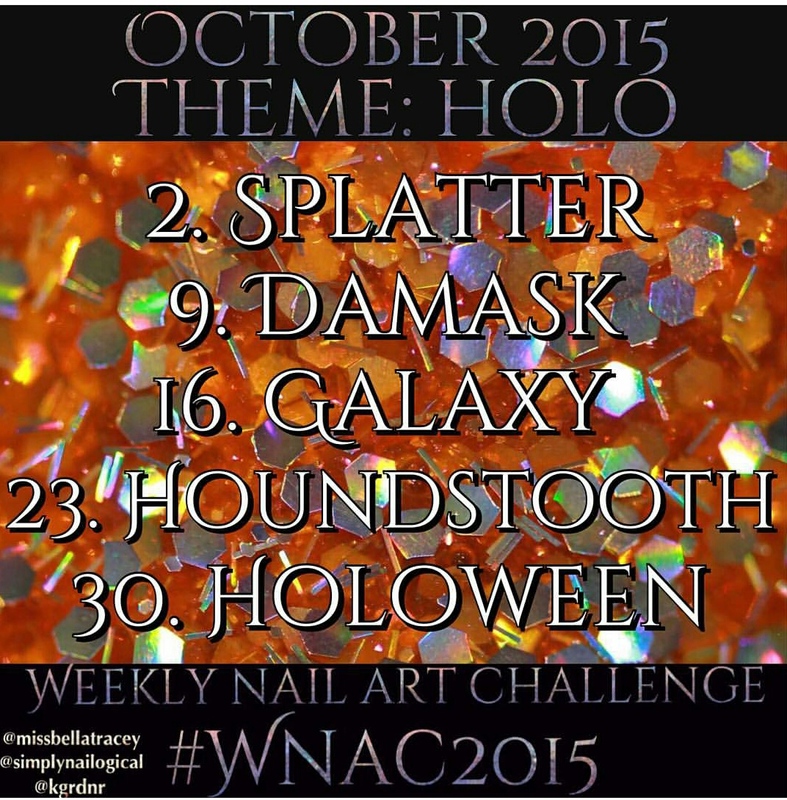 This months WNAC October 2015 challenge theme which is hosted by +Simply Nailogical, @missbellatracey, and @kgrdnr is HOLO and the first prompt was splatter. This should be fun! Let's see what I came up with! This is the third month now that I have taken part in this challenge! Yay me! Before I get into anything I figured I would show you what this months prompts are going to be. I've never done Houndstooth or Galaxy before so I'm hoping they turn out okay when I get around to those prompts! 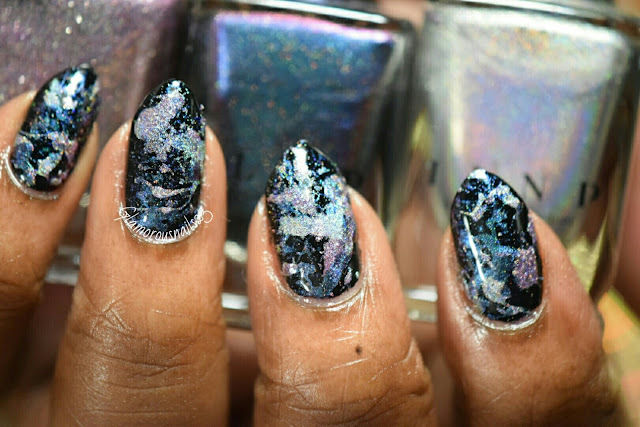 You know how people always that watermarble is such a messy nail art? 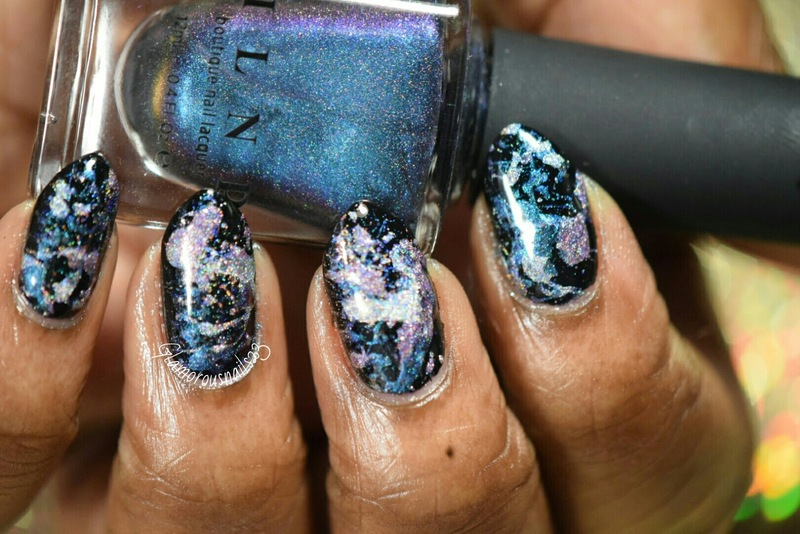 Well I think splatter nail art worse. 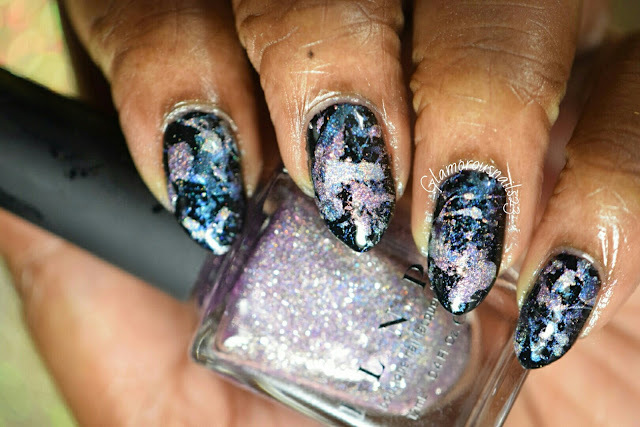 It was fun to do but even with a the peel of latex barrier that I used I still had polish on my knuckles and on the insides of my hand LOL. This was my first time attempting to do splatter nails and despite the extra mess that I created I really did have fun with this prompt and love the out come. I did get some big blobs while doing this. Maybe because I was holding the straw too close? Maybe I'll try this again in the future...maybe. 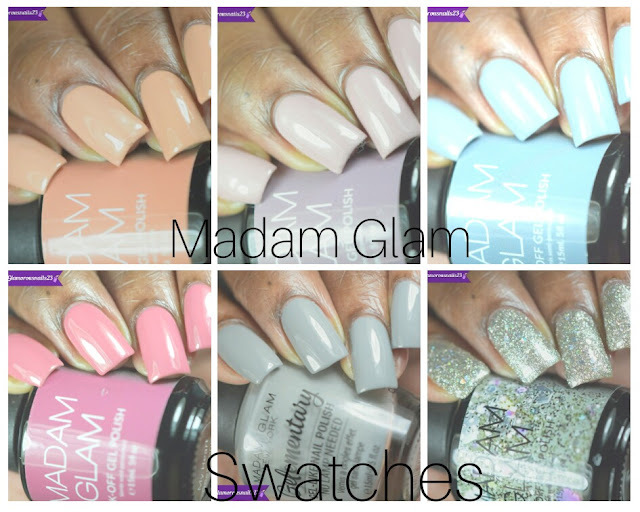 What nail art challenges are you taking part in this month? 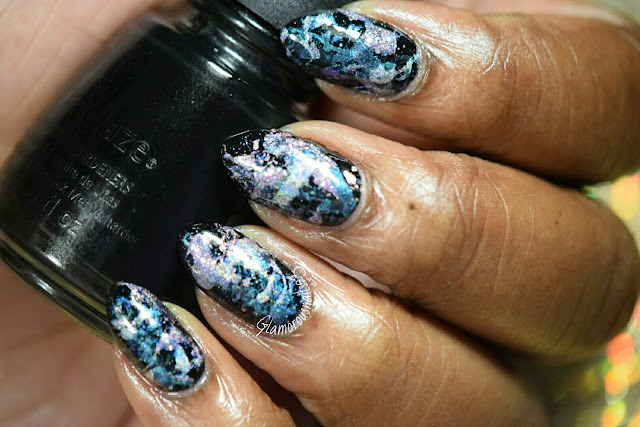 Have you ever done splatter nail art before? 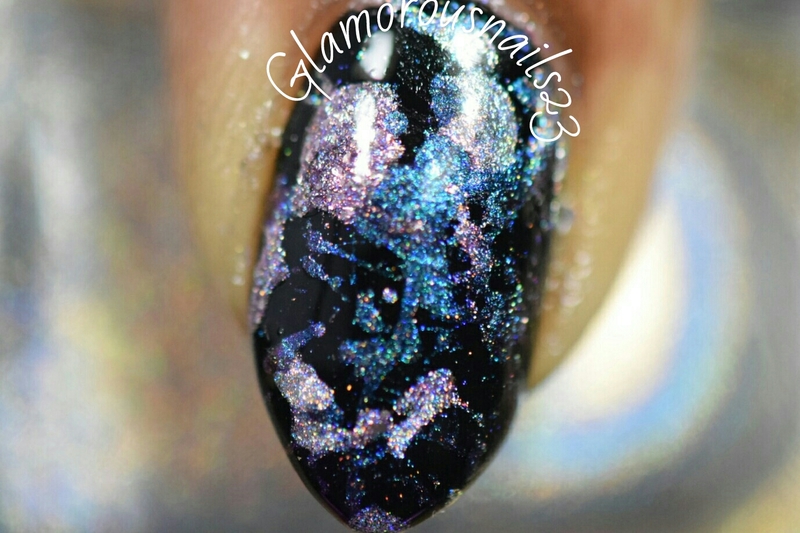 Which one do you think is worse watermarble or splatter? Let's chat down below! Looks great!! Love that close up! Thanks so much Tracey! I can't wait to see how yours turn out. This is definitely one of the prettiest splatter manis I've ever seen! Nice job! I've never tried one of these but love the look! Thanks Amanda! LOL I don't blame you. 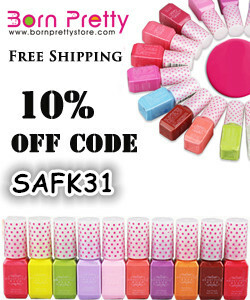 It may be a while before you see me do another one of these!